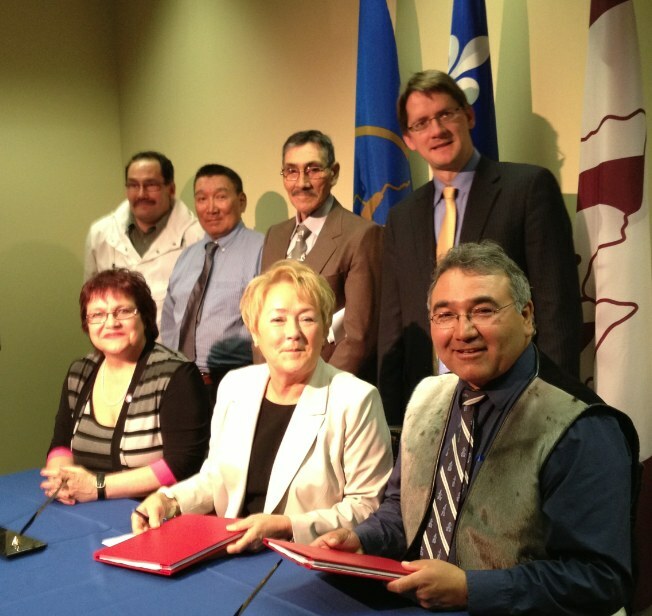 June 21st, 2013-Montréal, Qc – The President of Makivik Corporation, Jobie Tukkiapik, the Premier of Québec, Pauline Marois, and the minister responsible for native affairs, Élizabeth Larouche, today signed the Complementary agreement No. 23 to the James Bay and Northern Quebec Agreement (JBNQA). The signing took place in the context of a nation-to-nation work session organized at the Premier’s office in Montreal. The signing of this agreement will lead to transfer of ownership of Category I lands in Ivujivik to the Nuvummi Landholding Corporation. It will also establish Category II lands over which Nunavik Inuit have, among other things, exclusive harvesting rights. “Today we make history where another indication of land claims agreements are not a “begin all and end all” developments in our relations with governments and other stakeholders. Although our forefathers signed the JBNQA 38 years ago, it continues to evolve with the times” said the President of Makivik Jobie Tukkiapik. The new category I lands encompass, from the centre of the community of Ivujivik within a radius of forty kilometres (40 km, 24.9 miles), an area of five hundred and twenty-four square kilometres (525 km2).